Standerwick 59 Transylvanian Express, ? Unknown owner in Ilkeston (?/1999). The Rocket, Yate (1/1990). Bedworth Christian Centre (7/1995). 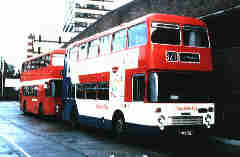 Associated Bus Ministries, Godstone (8/1996). Booker Gliding Centre, High Wycombe (Not known).